Certified. CARFAX One-Owner. Clean CARFAX. ACC Stop Go + Active Driving Assistant, Advanced Real-Time Traffic Information, BMW Online BMW Apps, Comfort Access Keyless Entry, Giga Leather/Cloth Interior, Giga World, Natural Leather/Cloth Upholstery, Navigation Professional System, Smoker's Package, Technology Driving Assistant Package, Universal Garage-Door Opener, Wheels: 19' x 5.0' Front 19' x 5.5' Rear Giga. Odometer is 8133 miles below market average! Awards: * Green Car Journal 2015 Green Car of the Year * 2015 KBB.com 10 Best Green Cars Based on 2017 EPA mileage ratings. Use for comparison purposes only. Your mileage will vary depending on how you drive and maintain your vehicle, driving conditions and other factors. Reviews: * Roomy four-person cabin quick acceleration and strong brakes nimble handling excellent visibility well-made and stylish interior versatile cargo area for an EV available gasoline-fueled range extender. Source: Edmunds * With its sustainable design and undeniable BMW agility, here's an EV that's bound to change the way you think about driving. Using extremely strong yet lightweight Carbon Fiber Reinforced Plastic (CFRP) as its foundation, this vehicle is as innovative as the technology and renewable materials it's built with. 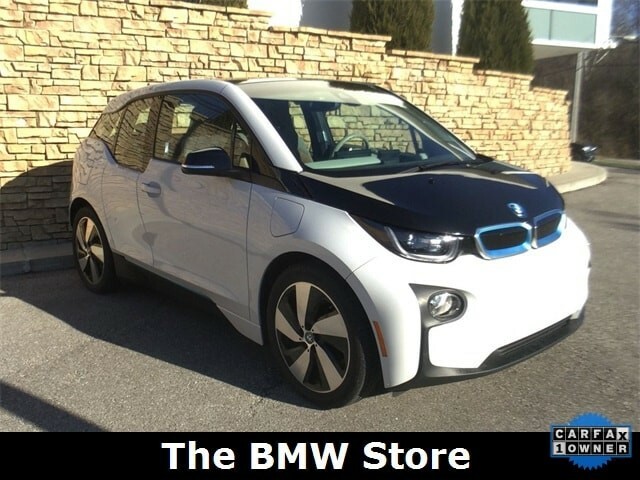 In the standard yet sporty COMFORT mode, the range of the BMW i3 is 70 to 110 electric miles on a single charge, depending on driving style, traffic conditions and the topographical features of your route. In ECO PRO mode, which operates with an adapted accelerator pedal that demands less power, the possible distance traveled increases by up to 12%. The BMW i3 with Range Extender increases your electric driving range by up to 75 miles to eliminate range concerns. Via the BMW i Charging Station, the battery is fully charged in approximately 3.5 hours. The electric motor of the i3 was designed for instant power, delivering 170hp with a torque of 184 lb-ft. With the BMW i Remote App for iOS and Android, you can receive detailed information about the current status of your BMW i3 at any time. This includes, for example, range display, battery conditions and charge levels, service messages, and even the vehicle location. The new iDrive 4.2 Navigation System showcases an optimized menu display with state-of-the-art technologies, like advanced real-time traffic data. BMW apps let you access social networks, music plug-ins, and video playback through your iPhone as you see them on the vehicle's display screen. With BMW TeleService your i3 will continually monitor specific vehicle parts subject to wear and tear as well as needed services and transmit that data to a BMW service center for easy diagnosis. Source: The Manufacturer Summary * Powerful and fuel-efficient engines engaging handling upscale interior hatchback-style utility. Source: Edmunds Stop in today! Passion Loves Company.